Metals such as Ruthenium have special properties that too many are a key a higher spiritual ascension, to others a closer connection to the infinite for inspiration and wisdom, but to the modern day scientists, answers to the restoration of defective DNA that leads to a perfect well-balanced metabolism. ​Reported in the Mid 1980’s to be anti-cancerous by Bristol-Myers Squib Reported correcting the defective DNA strand when electrical current is applied. Many new medicinal applications have been discovered, and they are quite impressive. Ruthenium (From the platinum metal groups) The "May 1995 issue of Scientific American, has reported The researchers examined the electrical properties of short lengths of double- helix DNA in which there was a ruthenium atom at each end of one of the strands. When they measured the rate of flow along the ruthenium- doped double helix: the current was up by a factor of more than 10,000 times over a million electrons a second. This research concludes that there is thermodynamic conductivity that may cause DNA to correct its self. It is believed that potential DNA problems, and Aging my effectively be reversed with the Noble Metals. Our High PPM Ruthenium is a non-prescription dietary supplement providing in a safe and bio-available form. "Precious metals have been used for medicinal purposes for at least 3500 years, when records show that gold was included in a variety of medicines in Arabia and China. At that time precious metals were believed to benefit health - because of their rarity - but research has now linked the medicinal properties of inorganic drugs to specific biological properties. The elucidation of a drug mechanism is however complex and the exact route of activity for many drugs remains unknown. The biological targets or mechanism of action of many metal drugs are now being resolved step by step, and this information is then used to design improved drugs with increased potency and reduced side effects. In the search for drugs with improved clinical effectiveness, reduced toxicity and a broader spectrum of activity, other metals than platinum have been considered, such as rhodium and ruthenium. Non-platinum active compounds are likely to have different mechanisms of action, biodistribution and toxicities than platinum-based drugs and might, therefore, be active against human malignancies that have either an intrinsic or an acquired resistance to them. Ruthenium complexes are very promising, especially from the viewpoint of overcoming cisplatin resistance with a low general toxicity. Ruthenium has found its way into the clinic, where its properties are exploited for very miscellaneous uses. The radio physical properties of 97Ru can be applied to radio diagnostic imaging. Other ruthenium compounds have potential as immunosuppressant’s (cis-[Ru(III)(NH3)4(HIm)2]3+), antimicrobials (e.g. organic drugs coordinated to ruthenium centers, such as [Ru(II)Cl2(chloroquine)2] against malaria and others for the treatment of Chaga´s disease), antibiotics (ruthenium complexes of organic antibiotic compounds, e.g. the Ru(III) derivative of thiosemicarbazone against Salmonella typhi and Enterobacteria faecalis), nitrosyl delivery/scavenger tools (e.g. the Ru(III) polyaminocarboxylates known as AMD6245 and AMD1226 to treat stroke, septic shock, arthritis, epilepsy and diabetes), sodilator/vasoconstrictor agents and, as above mentioned, as drugs for cancer chemotherapy. (iii)The ability of ruthenium is to mimic iron in binding with certain biological molecules. Many ruthenium complexes have been evaluated for clinical applications, particularly in the treatment of cancer, due in part, to Ru(II) and Ru(I1I) complexes having similar ligand exchange kinetics to those of PtQl) complexes. Lpnd exchange is an important determinant of biological activity, as very few metal drugs reach the biological target without being modified. Most undergo interactions with macromolecules, such as proteins, or small S-donor compounds and/or water. Some interactions are essential for inducing the desired therapeutic properties of the complexes. As the rate of hgand exchange is dependent on the concentration of the exchangmg hgands in the suirounding solution, diseases that alter these concentrations in cells or in the surroundmg tissues can have an effect on the activity of the drug. The uxidation state changes of ruthenium in cancer and healthy cells. The reductive environment of cancer cells favours Ru(II). which ismore biologically active than Ru(III). Hence Ru( III) compounds are essentially prodrugs that become activated by reduction on reaching the cancer cell. Ruthenium is unique amongst the platinum group in that the oxidation states Ru(Il), Ru(I1I) and R u m are all accessible under physiological conditions. In these oxidation states the ruthenium centre is predominantly hexacoordinate with essentially octahedral geometry, and R u g complexes tend to be more biologically inert than related Rum and (IV) complexes. The redox potential of a complex can be modified by varying the ligands. In biological systems glutathione, ascorbate and single electron transfer proteins are able to reduce Ru(IIl) and R u m , while molecular oxygen and cytochrome oxidase readily oxidise Rum. The redox potential of ruthenium compounds can be exploited to improve the effectiveness of drugs in the clinic. For example, the drug can be administered as relatively inert Ru(I1I) complexes, which are activated by reduction in diseased tissues. In many cases the altered metabolism associated with cancer and microbial infection results in a lower oxygen concentration in these tissues, compared to healthy ones, and this promotes a reductive environment. Cancer cells are known to have higher levels of glutathione and a lower pH than healthy tissues, creating a strongly reducing environment. If the active Rug9 complex leaves the low oxygen environment, it may be converted back to Ru(I1I) by a variety of biological oxidants. Proteins that can catalyze the reduction of Ru(I1I) to Ru(II) include mitochondrial and microsomal single electron transfer proteins. The mitochondrial proteins are of particular interest in drug design as apoptosis, the desired mechanism for cell death, can be initiated in the mitochondria, as well as by other pathways, for instance, by the Fas/FasL pathway. Transmembrane electron transport systems can also reduce Ru(I1I) complexes outside of the cell and this is highly relevant to the mechanism of action of a ruthenium-based drug in clinical use which has anticancer activity independent of cell entry (vide inpa). The low toxicity of ruthenium drugs is also believed to be due to the ability of ruthenium to mimic iron in binding to many biomolecules, including serum transferrin and albumin. Schematic representation of the selective uptake of transferrin by cancer cells. Ruthenium can mimic iron in binding to transferrin. Metal-loaded transferrin is delivered to cells according to the number of transferrin receptors on their surfaces. As most cancer cells have a higher number of transferrin receptors (left), compared to healthy cells (right), ruthenium is target. These two proteins are used by mammals to solubilize and transport iron, thereby reducing its toxicity. Since rapidly dividing cells, for example microbially infected cells or cancer cells, have a greater requirement for iron, they increase the number of transferrin receptors located on their cell surfaces, thereby sequestering more of the circulating metaloaded transferrin. The exact increase in radio-labelled ruthenium compounds in cancer cells, compared to healthy cells, has been shown to range from 2-12 folds, depending on the cell type. As the drug is targeted to cancer cells, its toxicity is reduced because less of it will reach healthy cells." 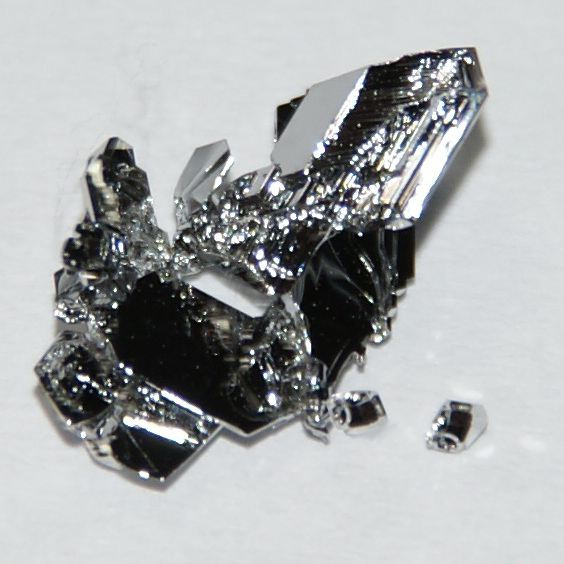 Doing some due diligence on how Ruthenium is used for medical purposes, you will find many articles and scientific papers on several online Ebook Websites.